Roger Rosenblatt is blessed with the ability to write in almost every literary genre, to elide different forms beautifully, and to step between them with grace. 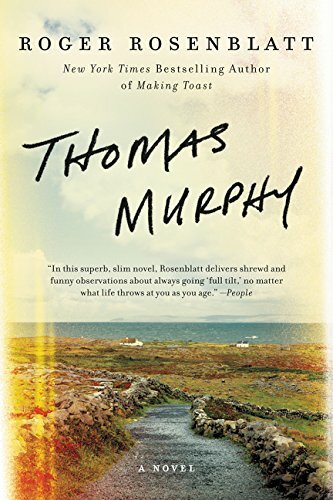 That skill is on dazzling display in Thomas Murphy, a memento mori that recalls two of Rosenblatt’s earlier books—Making Toast and Kayak Morning—each of which dealt with loss while appearing to be about something else. The question of appearances occupies Thomas Murphy, too. Is the lovable Irish rascal demented and in the throes of Alzheimer’s disease, as his daughter Máire, a 40-year-old single mother, fears? Or is he more self–possessed and saner than all the other characters combined? There is a lot to be said for his life philosophy that is both earthy and still full of heart. The plot ostensibly revolves around the aging poet’s scheming to escape a neurological consultation that Máire has roped him into. He fails, of course, and the book turns into something more meaningful and more poignant. He tells his grandson—a character evocative of the grandson in Making Toast—that “We make good poets because we know how to deal in absent things, the things taken from our lives.” In keeping with the theme of loss Murphy is asked by a stranger with a knack for making others feel sorry for him, and who claims to be dying of cancer, if the poet would be good enough to break the news to the stranger’s blind wife, Sarah. Sarah is decades younger than Murphy, and although she may be blind she sees well––especially into others’ hearts. Soon her heart becomes entwined with Murphy’s.